He just goes by Jonathan, ‘cause he’s real laid back dude. Jonathan is a Seychelles Giant Tortoise which is a pretty rare subspecies to the Aldabra giant tortoise. He has some Aldabras to hang out with but he’s not getting any... he’s never gotten any, poor lad. That’s a recent picture of Jonathan, there aren’t any baby pictures of him because there weren’t any cameras. There also wasn’t any telephones, postage stamps, electric lights, skyscrapers, telegraph, or Eiffel Tower. That’s because Jonathan was born hatched in 1832. Guinness has declared him at 187 the World’s Oldest Living Animal on Land. Born on the small African island nation of the Seychelles, in the Indian Ocean, Jonathan was relocated to a new home in 1882, at the age of around 50. He was moved to the tropical island of St. Helena, a British overseas territory in the South Atlantic, as a gift to St. Helena’s Plantation House, the official residence of the island’s Governor. 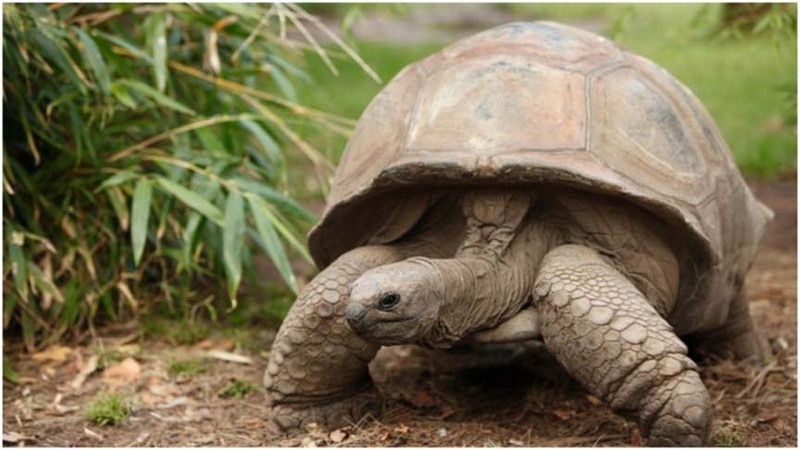 The average life expectancy of Seychelles giant tortoises is around 150 years. 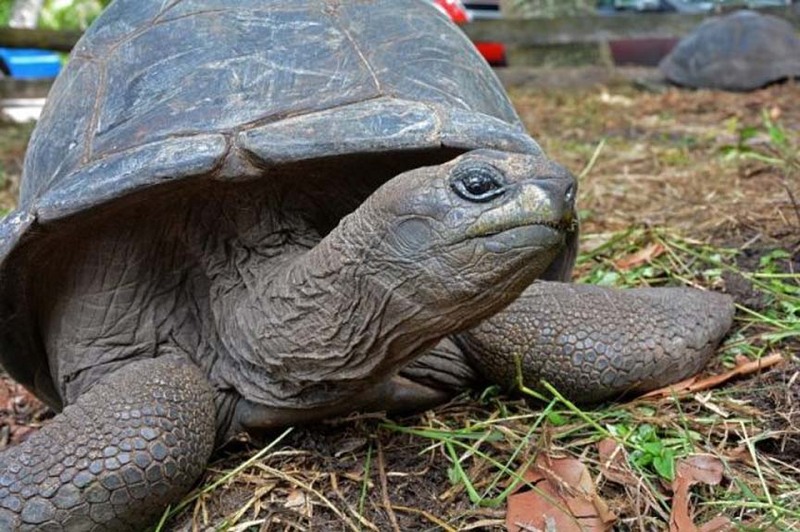 But at 187-years-old, Jonathan is very close to stealing the title of oldest ever reptile of the order Testudines, which includes all tortoises, turtles, and terrapins. This title is currently held by Tu’i Malila, a radiated Madagascar-born tortoise that Captain James Cook gifted to the Tonga royal family and who lived from 1776/1777 until 1965 (or at least 188 years of age). Old age has left Jonathan’s vision and smell impaired, though his overall health is quite good. He is also nourished with foods appropriate for his age — fruits and vegetables including apples, cucumbers and carrots. A diet of only leaves and grass found on the ground is considered not so healthy for advance-aged tortoises. To put a wider perspective on how long Jonathan has lived: he would have hatched some six years before Queen Victoria was crowned the Queen of the United Kingdom of Great Britain and Ireland, in 1838, when she was just 19. Jonathan outlived her reign and those of the next four monarchs — Edward VII, George V, Edward VII and George VI. The chances are he might even outlive the current reigning Queen of the United Kingdom and other Commonwealth realms, Elizabeth II. Jonathan is one of the few remaining Seychelles giant tortoises, a subspecies to the Aldabra giant tortoise. They were hunted to near extinction by European sailors back in the 19th century. A small surviving population is maintained under a breeding program on Silhouette Island in the Seychelles archipelago. Jonathan’s friends, the Aldabra giant tortoises number about 150,000, whereas only 94,000 humans on the Seychelles islands. He missed seeing Napoleon Bonaparte on St. Helena by only a decade, but I doubt he cares. Told you he's laid back. Too bad about our well-shelled incel up there. If he's not blind and deaf, maybe a little tortoise pron would be welcome. Never heard a turtle before.